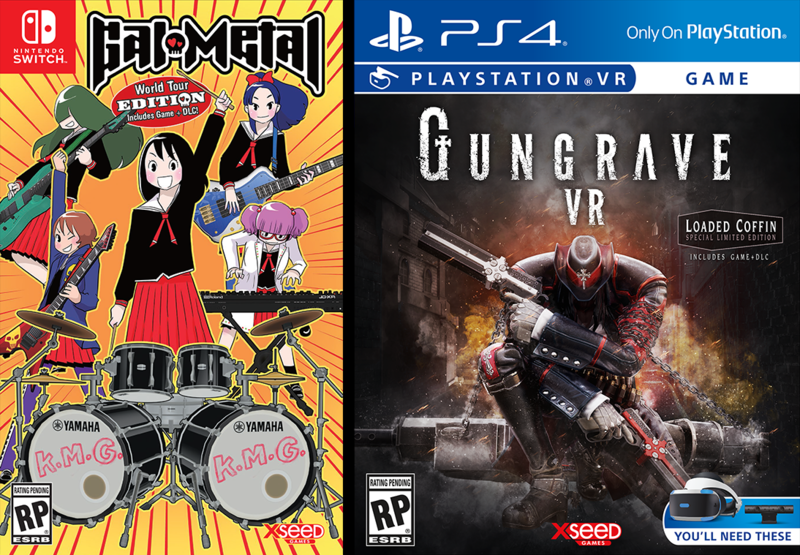 Torrance, Calif. — July 18, 2018 — XSEED Games, the independent-minded publishing brand of Marvelous USA, Inc., today announced the contents of the retail editions for GUNGRAVE VR, the PlayStation®VR for PlayStation®4 computer entertainment system shooter featuring third- and first-person gameplay modes, and Gal Metal, the rhythm-based Nintendo Switch™ exclusive where the players rock out to their own beat to save the world from an alien invasion. For upcoming details on where to pre-purchase both titles, be sure to visit the XSEED Games Twitter and Facebook pages! In GUNGRAVE VR, players take control of Grave with his iconic set of dual guns, Cerberus, and will have to master different playstyles to take down the various foes that stand in his way. Levels consist either of free-moving third-person gameplay or first-person action that includes both stationary and mobile sections, offering players a variety of modes to help put them in the shoes of the resurrected Millennion agent himself. With an array of shooting attacks, close-range strikes using Grave’s coffin, Reaper Time, and more, GUNGRAVE VR brings an authentic Gungrave experience to virtual reality for the very first time. GUNGRAVE VR will be published for PlayStation®VR for PlayStation®4 system by XSEED Games digitally and at retail in Fall 2018. This title has not yet been rated by the ESRB. Gal Metal is a rhythm game designed for Nintendo Switch that turns each Joy-Con™ into a drum stick. Players will take hold of the Joy-Con to rock along with the music as they create their own complex performances and rack up millions of points using personal free-form drum lines based on over a dozen different beats. With Nintendo Switch™ Pro Controller support on offer as well, players will be able to choose how they want to jam and earn metal power to use against nefarious alien invaders in this uniquely adlib-friendly rhythm experience. Gal Metal will be published for Nintendo Switch by XSEED Games physically and digitally in Fall 2018. This title has not yet been rated by the ESRB.